Hands up everyone here who found a two-foot-tall serious chef’s cookbook under the tree this past Christmas, all filled photos that could hang in MONA and printed on paper as lush as Dean Martin laughing at Frank Sinatra punching somebody? Wow, all three of you. Now, just about a month on from the Nativity, how many of you have actually taken the thing into the kitchen? Yeah, the Prick’s got a big stack on the coffee table too. You know, for inspiration. But here’s the thing with these gorgeous, expensive cookbooks: If they aren’t cooked from, what are they for? A cynic would argue these works are nothing more than a marketing ploy where the customer has to pay for the advertising: Buy the cookbook, look at the pictures, come in for a meal, or at least increase the “buzz” around the name. The Prick is no economist but restaurants are notoriously tight-margined and a best-seller surely helps pays the bills or at least drive foot traffic for a lot of chefs in the same way celebrity endorsements are where the gravy is for, say, athletes. But stepping back from the business side of things these illuminated manuscripts are – or should be – at heart about getting a cook from A to B to finished dish, even if said cook does not have an army of commis chefs tending stocks and chopping onions from first light. This may not be every day food. But if you care about eating and see it as more than just a way of fuelling up, it’s not a bad idea to have a go at this high calibre cooking from time to time (even if one winds up using a few cheats and shortcuts to make up for the aforementioned lack of kitchen hands). Thus on a recent Sunday afternoon the Prick decided to give recipes from a couple of signature books a go. One from a new acquisition, the Sepia cookbook (thanks Mrs Prick! 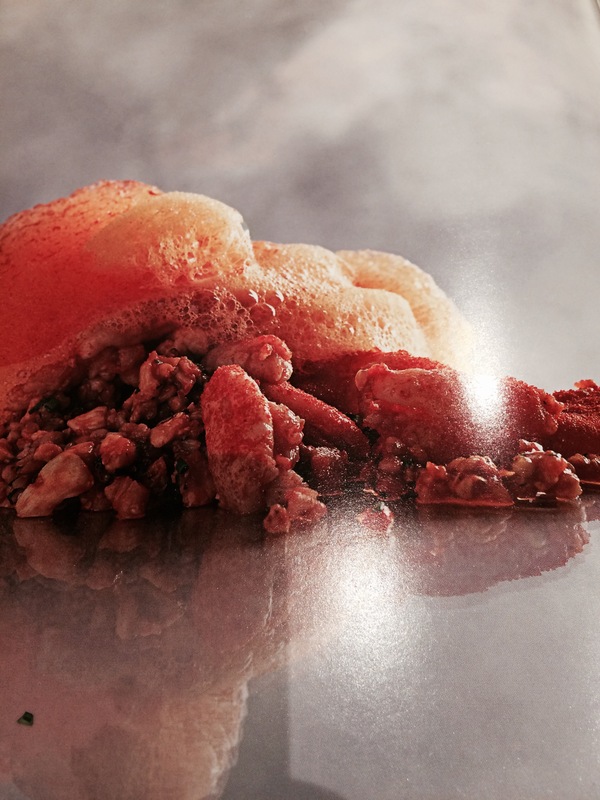 ), which promises that the reader might be able to recreate at least some of the delights of Martin Benn’s much-hatted, much feted Sydney restaurant, the other from Thomas Keller’s Under Pressure, which was the sous-vide book to end all sous-vide books before we all had benchtop immersion circulators and cabinets full of molecular powders. Despite the name this is a simpler dish than it sounds and doesn’t require esoterica like carbonised bamboo powder (found in the carbonised bamboo powder aisle of your local supermarket) or Japanese binchotan charcoal. Though there were a couple of cheats: For one thing, as this was being made for two rather than eight, there was little chance that we were going to make a litre or so of shellfish stock, and instead substituted a really tasty “sustainable” crab stock instead. It should also be noted that the picked fresh spanner crab meat was deleted in favour of langoustines: There were some gorgeous ones in the markets that morning, and as the Prick generally enjoys his day job he did not need to spend his Sunday denuding crustacea to make Monday’s ordeals seem more pleasant. The results were … well, really bloody amazing if a Prick does say so himself … at least taste-wise. The presentation however – and entirely through the Prick’s own maxima culpa – wound up being nothing short of disastrous. In the enthusiasm of the moment, the laws of thermodynamics were forgotten and a quenelle of room-temperature compound butter perched artfully on a tight mound of steaming-hot buckwheat melted and fell away like the French army in 1941. But if the cooking cops were strictly enforcing the rules of heat transfer in the Stately Prick Manor test kitchens, they were turning a blind eye to the statute books on chemistry. Despite fiercely precise measurements of all ingredients involved, right down to the exactly four damn grams of lecithin, there was no way a stable foam was forming, and even to call what resulted a sauce would be considered charitable. 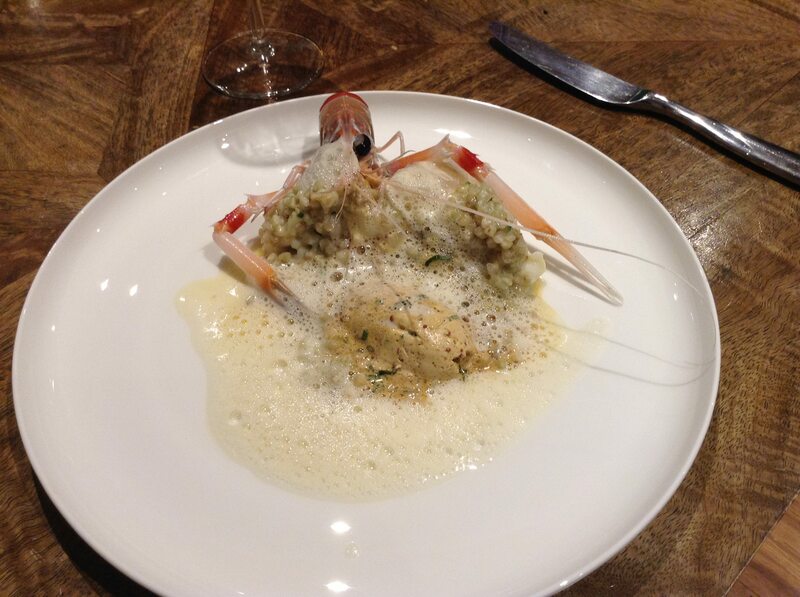 And the Prick didn’t help matters either, perching a poor langoustine’s head on top of the whole affair as garnish. In hindsight, there are too many other things in this world that are fecklessly parlous in a late-‘70s sort of way that we should be doubly wary of the gastro-decorative traps of the era. Oh, and the tomato powder was made but forgotten in the heat of battle, though a lovely gazpacho which got us through the week was a happy by-product. Still, with the lights dimmed (and a 2009 Grace Kayagatake from Japan in the glass), all was not lost. The buckwheat was a revelation and played brightly against the dark, earthy shellfish stock which infused and which barely poached the langoustine tails. The brackish wouldn’t-foam still remained a bracing, salty kiss. And that butter … you get the picture. And in fact with some re-tooling, and better luck with the lecithin, this could evolve into, to use a horrifying phrase, the Prick’s “take” on a Sepia classic. Eight tentacles up for octopus! 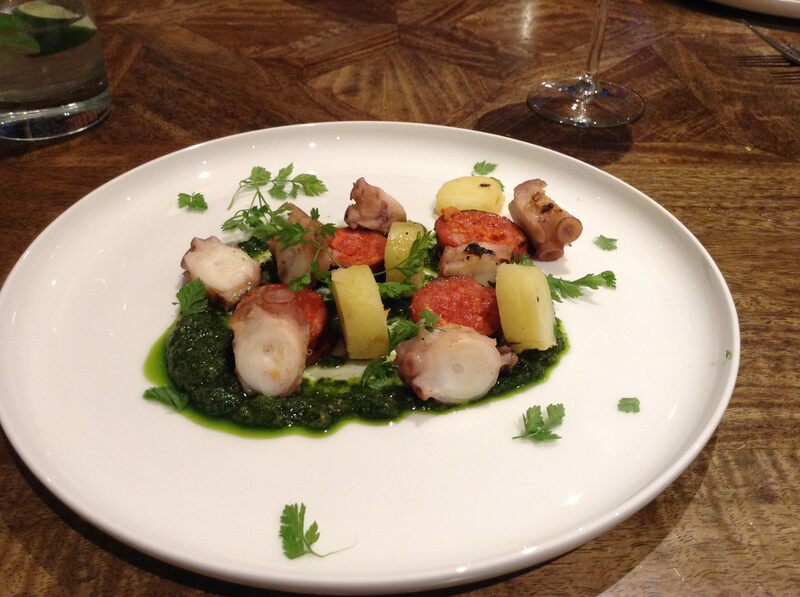 The key to this dish is the octopus, which gets five hours in the water bath at 77C (or 170F in the old money) with an herb sachet, as well as using a good chorizo. Oh, and a bright salsa verde with a big handful of basil and smaller doses of fresh tarragon, cilantro and parsley, al quickly blanched and shocked, and whizzed with olive oil, toasted ground cumin and coriander seeds, and finished with a squeeze of lemon and minced capers. And kipfler potatoes, just boiled and then peeled and cut into discs. Sydneysiders and those with a good fish market nearby can get sashimi-grade tentacles already trimmed and ready to go, saving time if not money and making this a relatively easy dish that can be fancied up on a plate or tossed together in a salad, as indeed were the leftovers which were happily consumed desk-side by Mrs Prick the following day to the furrowed brows of jealous co-workers. Well you have a lot more ambition than I do in the kitchen. A stellar effort.